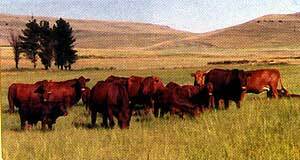 The Bonsmara has been scientifically bred and strictly selected for economical production in the extensive cattle grazing regions of South Africa. 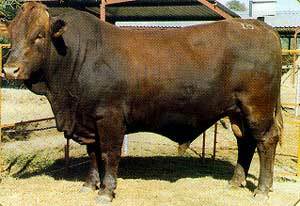 The Bonsmara has become so popular that it has grown to be numerically the strongest beef breed in South Africa in less than 25 years. During the years prior to World War II a need was felt for a beef breed which could produce economically in the sub-tropical regions of the Transvaal and Natal. Notwithstanding their adaptability to the climate, the indigenous Afrikaner-type cattle did not have the desired growth potential, they were relatively late in reaching sexual maturity and many of the cows did not calve regularly. The exotic British beef breeds available at the time performed well in the more temperate regions but could not keep up the same production in the hotter environment. They were also more susceptible to the tick-borne diseases which were prevalent in the sub-tropics. The Department of Agriculture consequently decided to test the performance of various cross-breds between the indigenous and exotic breeds on its experimental farms, Mara and Messina. Bulls of five British Beef breeds were used on Afrikanner cows and the progeny then performance tested. After pilot trials it was decided to continue only with the better performing Hereford and Shorthorn cross-breds. Ultimately three-quarter Afrikaners were mated to half-breeds to obtain progeny with 5/8 Afrikaner and 3/8 Hereford or Shorthorn blood. Through strict selection of breeding animals rapid progress was made. Within 20 years after the initial cross-breeding trials a superior cattle breed, performing better than other breeds in the bushveld of the Northern Transvaal, had been established. The name "Bonsmara" was derived from "Bonsma", the man who played a major role in the development of the breed, and "Mara", the farm on which the animals were bred. 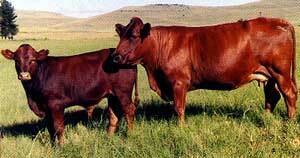 More and more cattle breeders became impressed by the productivity of this adaptable, functionally efficient breed. The number of active breeders rapidly increased from only 37 in 1970 to 459 at present. Likewise the number of registered Bonsmaras increased to considerably more than 87 400 performance tested and approved cows at present. Bonsmara calves now represent roughly 45% of all birth notifications of Beef and Dual Purpose breeds. The sustained use of Bonsmaras has led to constant improvements in weaning weights (at 205 days of age) of cross-bred herds. There have also been studies showing good results for calving percentage, weights of heifers as well as veld and feedlot adaptability. In summary, use the Bonsmara because it has been strictly selected for growth, fertility and functional efficiency, being the economically important traits emphasized by the master breeders of the cattle industry.